It is crazy that we need an Act to ensure that bathrooms are accessible in every situation but let it not be said that Obama just ignored the need as so many presidents before him. Just in the nick of time too. Thanks to his timely action, the men save face and can be satisfied that it did not need to wait for a woman president to make sure that they had a place to change babies diapers in public restrooms. Situation? 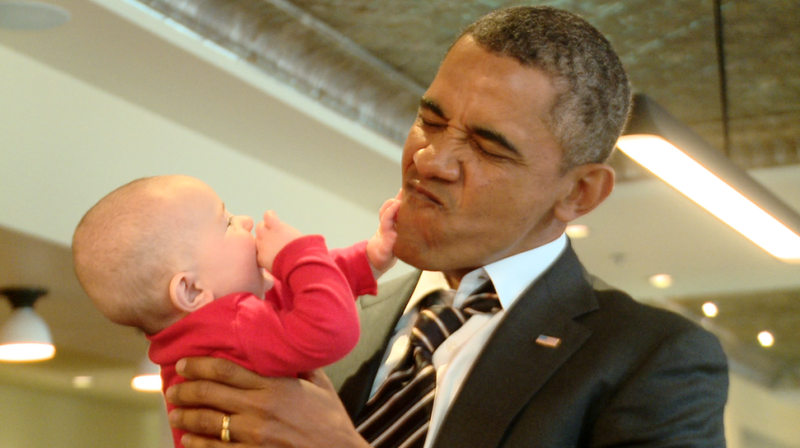 Obama and Baby aren’t seeing eye to eye …or maybe one of them’s gotta GO. You know what else is crazy? BABIES as an acronym for BAIES or really BAES though it is obvious that they cooked up the name of the Act so that they could call it BABIES. Every situation? As in, “we’re having a situation here?” If they really wanted to they could have called it Bathrooms Accessible (Barack) in Every Situation so that between this and Affordable Care we have the President’s full name on two important acts. Maybe he has time to pass one more good one and get his middle name on there too – now that would be a coup! There is one summary for H.R.5147. Bill summaries are authored by CRS. Obama on the floor playing with a baby.